The crew of the second FPB 64, Sarah Sarah, have just arrived in American Samoa from New Zealand, after a brief stop in Nieu along the way. Brian Rickard has just sent us a batch of photos to go with their reports, which follow. 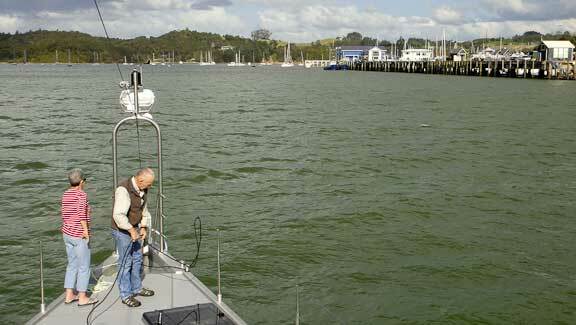 On September 01 at 09:42 local (2010 Aug 31 21:42 UTC, 2:42 PM PDT), “Sarah-Sarah” cast off from Opua Marina in New Zealand’s Northland region. 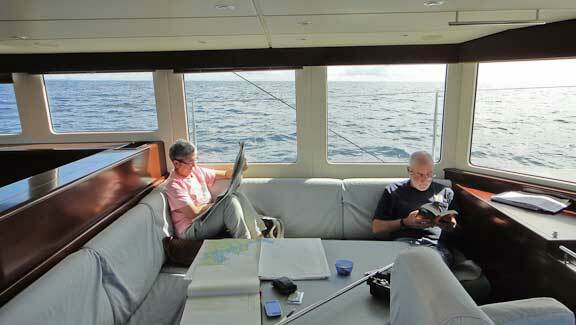 She has just past a point 312nm (359 miles) NNW off the coast of New Zealand, as measured from Cape Brett. 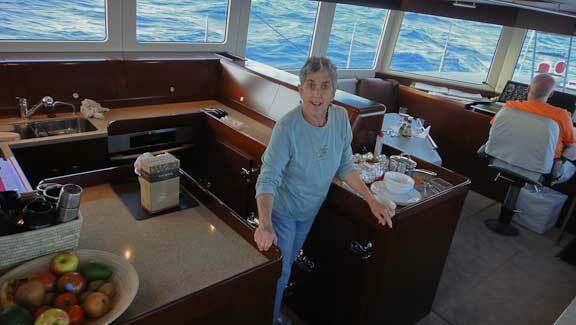 She made an impressive 219nm (252 mile) 24-hour run since passing Cape Brett, with an average speed of 9.1 knots (10.5 mph). Seas have been mild, with wave heights averaging about 2-3 metres (6-10 ft.), though the sea was virtually flat during the first few hours of the leg. For the past 24 hours, air temperature has remained at 56-57°F (13-14°C), with the sea at 64°F (18°C). Winds have been light, with an increase over the last few hours to 15-20 kts. (17-23 mph). The barometer steadily climbed to 1017 millibars over the first day, but has slowly declined over the past eight hours, or so, with a present reading of 1015 mb. There has been no rain, although we did divert slightly around a small rain squall this evening shortly before sunset. We had a couple of dolphins play in our bow wave briefly on our departure, and have been accompanied thus far by an albatross, a petrel, and pairs of a couple of other species we haven’t identified that fly zig-zag patterns, sometimes ahead, sometimes behind us. Last night we had beautiful skies for stargazing, with few clouds for most of the night. The Milky Way was fantastically bright, with great views of the Large and Small Magellanic Clouds, Venus and Jupiter, and of course, the Southern Cross. The engine and other systems are running quite well. The crew, also, are getting settled into the new routine, with Vonnie preparing delicious meals, and Bill, Don, John and Brian keeping 3-hour night watches. Our target is Rarotonga, in the Cook Islands, and our current course is intended to pass us just north of the uninhabited Curtis Island, hopefully sometime tomorrow afternoon. Since our previous update, “Sarah-Sarah” passed about 22nm (25 miles) south of Curtis Island (about midway between it and L’Esperance Rock), though the only signs we had of them were small blips on radar, a couple of small kelp mats floating by, and a temporary increase in the number of birds seen. These are both very small, with Curtis Island having a high point 500 ft., and L’Esperance Rock 230 ft. above sea level. 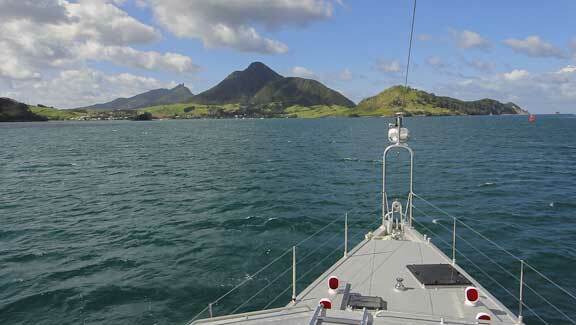 Soon after passing these, we turned our course a bit more northward (~NE) toward Rarotonga. We’ve been experiencing confused seas (no discernible pattern), for most of the past 24 hours, or more, with the last 12 hours being particularly rough. We’ve had the waves on our port beam for most of this time, but early this morning we again adjusted our course northward to about NNE in hopes of placing ourselves in a better position for a predicted wind change. Recently we’ve seen signs of improvement as the wind has backed to our port quarter with signs of further backing (counter-clockwise movement), however there were a number of times that “Sarah-Sarah” was tossed by a wave hitting us just the wrong way. Sleep didn’t come as easily last night as it had the previous nights, but we’re all very thankful for the stabilizers that have kept our rolling action to but a few degrees, though on a few rare occasions we have experienced a roll of 10°-15°. Though a little bouncy, the ride is so much more comfortable than what our eyes tell us we should be experiencing when we watch the sea conditions, that it almost makes it seem as if we’re not really here in the midst of it. In any other boat any of us has experienced, these conditions would have resulted in unsecured items being tossed around the cabin, made walking about the cabin a white-knuckled affair, and meant the use of lee cloths to keep us in our bunks while likely not getting any sleep at all. We had a mostly star-less, overcast night with our first rain shower in the wee hours, but this morning we’ve encountered some bright, partially-clear skies. We seem to have lost the albatross who was following us, though we still have a number of petrels dive-bombing the wave troughs all around us. 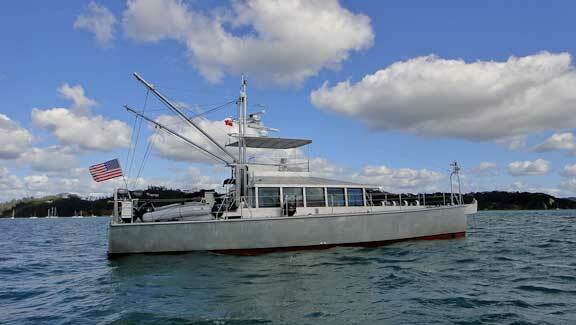 While composing this, we encountered our first vessel since departing New Zealand. The container ship “ANL Binburra” passed to our port on a roughly reciprocal course at a range of about 5nm (6 miles). 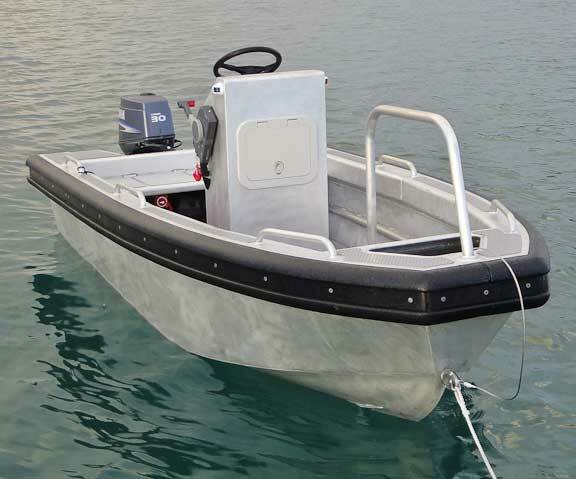 We know their identity because we are equipped with a receiver that picks up their AIS transmitter and overlays it on our radar and chartplotter screen. It was this that first tipped us off to their presence, though we then also observed a corresponding radar blip and were soon able to see them visually. 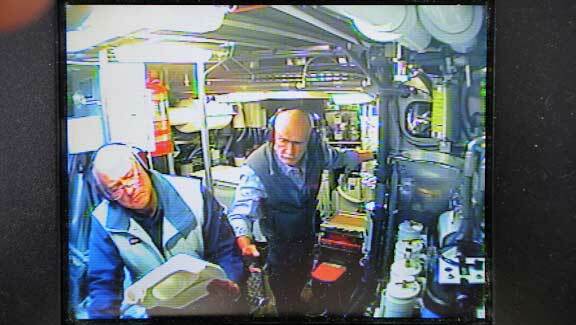 While going to the fly bridge for a better look at the ship, Don noticed a squid that had washed onto our aft deck. We took pictures of both the squid and the ship. 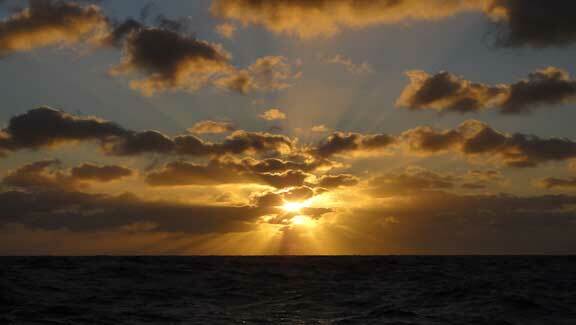 It is presently our hope that we will make Rarotonga in about four more days. After the rougher night reported last, yesterday the sea state changed favorably and we enjoyed a day of sunshine and smooth running with the sea swell pushing us along for a 230nm (265 mile) 24-hour run. We even had several consecutive hours with average speeds of nearly 10.3 knots (12 mph), and momentary acceleration while surfing down swells at up to 14.7 knots (17 mph). 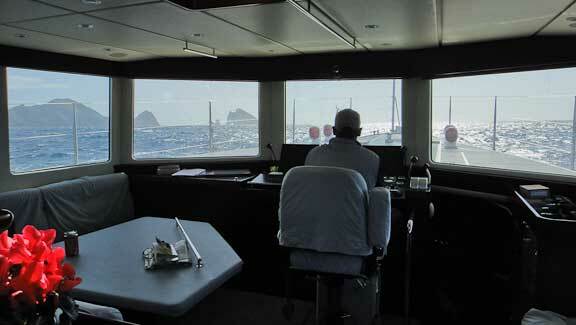 We spent more time on the fly bridge enjoying the sort of conditions we’d all been looking forward to. The air and especially sea temperatures have been climbing as we make our way northward, with the sea now at 72°F (22°C). In the wee hours of this morning those of us who were up were treated to a window of virtually cloudless skies and an astonishing view of the Milky Way just above the horizon for a full 360°! Today wasn’t quite as nice as yesterday; the seas became a little bit confused again in the early morning and never quite settled. We did have partly- to mostly-sunny skies, and were treated numerous times to the sight of flying fish skirting the waves, with diving petrels sometimes not far behind. We’re evaluating updated weather reports and are tossing about the idea of changing course to Nuie and American Samoa, if the predicted conditions we’ll soon receive appear more favorable than those toward Rarotonga. This alternate route might also allow a stop at the scarcely-populated Suwarrow (aka Suvarov) Island, which Vonnie has been greatly anticipating as a result of her research into possible ports-of-call. We forgot to mention previously that on September 2nd (which was the 3rd in New Zealand) we crossed the International Date Line, which was a first (by boat) for most of the crew. Even though it is probably a couple of weeks away, there has already been talk of what type of ceremony we’ll hold when we cross the equator, as 4 of the 5 crew will then be converted from “pollywogs” to “shell-backs”. Dinner is on, so we’re wrapping up the report for now. Shortly after sending our prior update, we made the decision to alter our course toward American Samoa, with a stop along the way at the island of Niue. The latest weather predictions led us to conclude that conditions would be more favorable to the north than to the northeast, the direction of Rarotonga. That was early in our 4th day at sea (as measured in 24-hour intervals from our time of departure); we are now about 6 hours into our 7th day. We haven’t written much about the 4th-6th days, as there were not many events worth reporting and the days seemed to blend together. However, we did see flying fish on numerous occasions, and at least twice found one or more of the less-fortunate creatures on our deck, even as high as atop our pilot house. One of these, while a little bloodied, had enough fight left that it just might have survived after we tossed it back into the sea. Back to today, while still more than 30nm (35 miles) from Niue, we encountered a region of dramatically higher seas and winds. The swells were about 2.5-3m (8-10 ft.), and the wind was gusting to as much as 42 knots (48 mph). One swell, perhaps 4m (13 ft.) high, or more, approached like a vertical wall of water off our starboard beam and gave us quite a roll. Over the next hour, or so, we encountered many more big swells, but none that matched that initial “biggie”. After picking up the first signs of Niue on radar at a range of about 24 nautical miles (about 27 miles), we are now only 6 nm (7 mi.) from its southern point and can easily see it protruding from the horizon like a flat pancake. At nearly 100 square miles (nearly 260 square km), Niue is reported to be the largest raised coral island in the world, with high limestone cliffs about its entire circumference. At our present speed ˜ averaging about 9.5 knots (about 11 mph) ˜ we expect to arrive at the only anchorage the island offers shortly before sunset. We’re hopeful that there will be sufficient daylight to facilitate anchoring, should we not be able to obtain a mooring ball. When Brian visited this island in 2004, there were only a couple of mooring balls in place, as most had been washed away by a cyclone sometime in the preceding months. 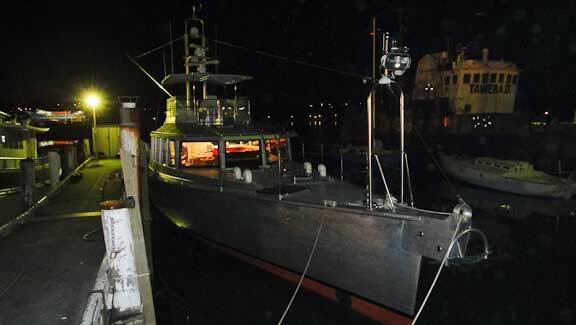 We’re unsure whether additional mooring balls have been placed in the intervening 6 years. Fortunately, the 20-knot (23 mph) winds are blowing from the east, as that is the only direction from which the anchorage offers shelter. 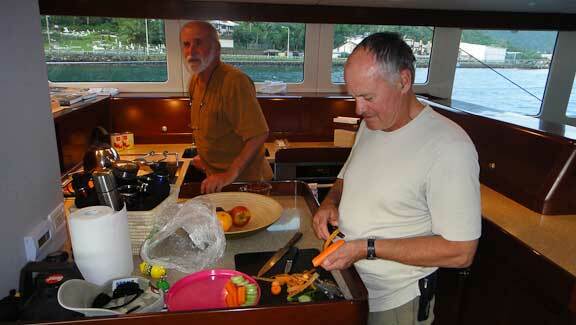 We’re planning to barbecue steaks for dinner, then clear customs in the morning so that we can go ashore. 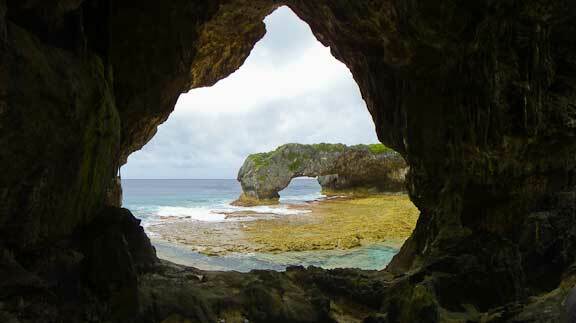 We’ll probably spend a couple of days at Niue before making the anticipated 22-23 hour passage to American Samoa. 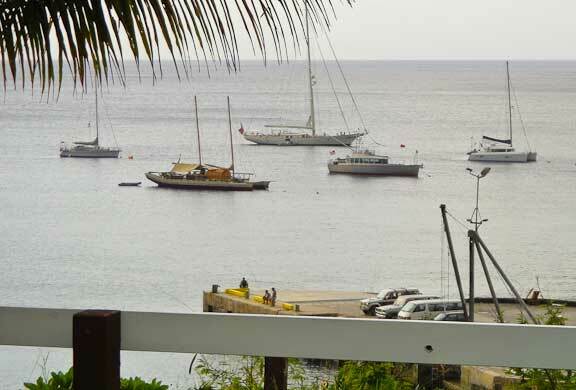 After a 6-day 7-hour 37-minute passage from Opua, New Zealand (quite fast, averaging 9.33 knots), the crew of “Sarah-Sarah” had a fun and mostly relaxing time at the island of Niue. 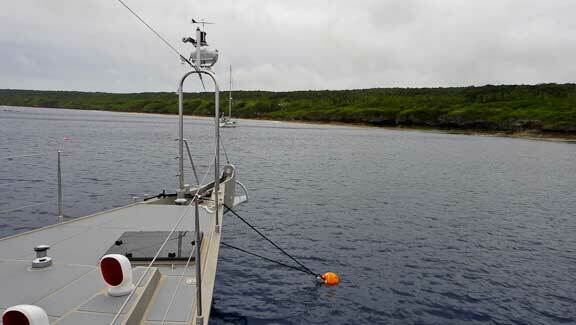 We were able to obtain a mooring ball in Alofi Harbor, as new moorings had been installed since the January of 2004 cyclone. There were a total of 18-19 vessels in the harbor during our stay (all others were sail boats). Brian recognized one of the other vessels in the harbor, “Freezing Rain,” a Hallberg-Rassy 46 belonging to Don and Marie Irvin. Brian has worked with them from the time their boat was commissioned by his brother’s business and periodically throughout their 8-year (thus far) cruise. We invited them to join us for ice cream on our second evening, and they enjoyed seeing the boat. Like most of the other “yachties” we encountered, they were aware of the Dashew FPB 64 project, and had been following its progress through the online blog at SetSail.com One gentleman from Canada who had built his own aluminum sailboat, expressed his admiration for Steve Dashew’s designs and said that he’d followed every posting while working on his own boat. Bill and Brian went on a whale watching/swimming trip conducted in a semi-rigid inflatable holding our guide and six passengers. While the one or two whales whose blows they spotted sounded (dove) before the boat could get close enough to swim with them, they did encounter dolphins a couple of times, and got to swim close to them. 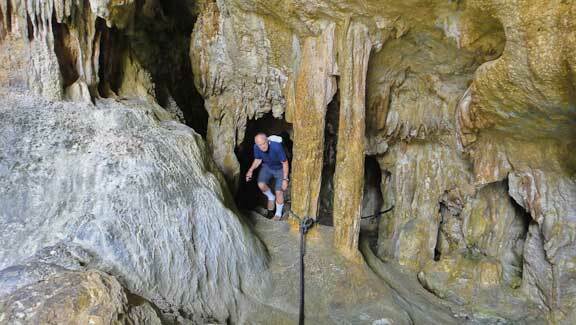 We hired a car and explored some of the island’s many coastal limestone caves and pools. 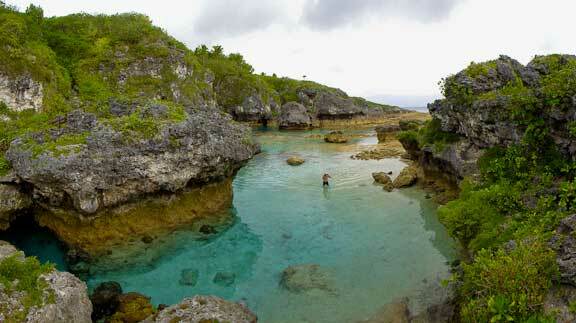 One such pool was restricted in the past to Niue kings, but is now open to the public. It has a 1-2 ft. layer of cool fresh water flowing out over the warmer salt water below. There are different types of fish in the two layers, from not-so-colorful fresh-water types to brilliant tropical varieties. While we chose to eat aboard “Sarah-Sarah” for most meals, we did dine out a couple of times in the Alofi Village, adjacent to the harbor. An interesting arrangement is that each of the several restaurants here (many being an extension to a family’s home) serves dinner on an assigned night of the week. It appears that this is done to maximise the attendance from the relatively small group of yachties (most of their clients), and makes each dinner a social affair. Don and Vonnie are ending their trip here, and flew back to Auckland Friday, where they were to catch another flight to the U.S. Although there are now only three of us to share the watches during passages, because we’re now only assigning one person per watch, we actually have more time to catch up on sleep (3 hours on, 6 hours off instead of 3 on, 3 off as when we had two people per watch). We cast off our mooring line shortly before 12:30 AM on Saturday morning, September 11, thus avoiding the alleged bad luck that sailors traditionally claim comes from departing on a Friday. 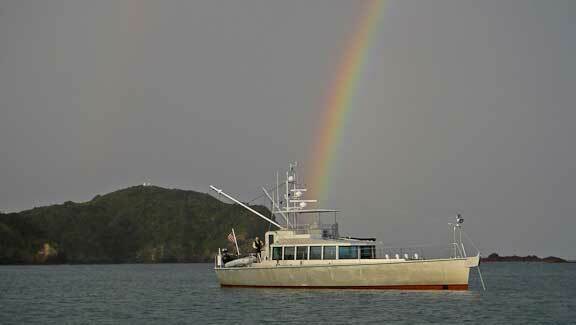 We are headed to Pago Pago in American Samoa, where we intend to take on more fuel and do some light provisioning. We are presently 37 nautical miles (42.5 miles) from the harbor entrance, and expect to arrive shortly before 10:00 AM, local time (UTC -11 hours, we think). Our stay there will probably be only a day, or two, depending upon how early we can get a fuel reservation (competing with commercial fishing vessels), whether we’re able to receive a replacement part here for our watermaker, and how attractive we find the island to be. Then we plan to continue on to the Kiribati Islands. A few random photos from New Zealand follow. This entry was posted on Tuesday, September 14th, 2010 at 9:43 am and is filed under FPB 64 Updates. Both comments and pings are currently closed. I was starting to have withdrawal symptoms from lack of updates!! !